Early in April 2013, I had the privilege of meeting and photographing a true old time master at work - Russ Bigelow of Winchester, NH. Russ has been a harness maker and leather worker for over 50 years and on this day, Russ was making a belt for my friend Doug Quigley. 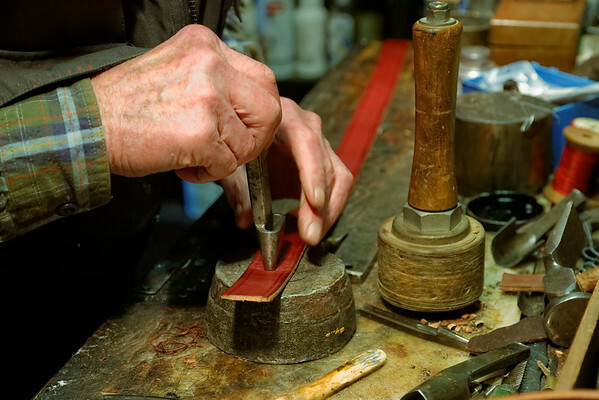 With decades of experience, literally hundreds of tools and the willingness to tackle any project, even at 80 something, Russ keeps the art of traditional leather work alive and well. A sad update - Russ Bigelow passed away in October 2014. He was a master craftsman, an artist, a good friend and an all around wonderful human being.